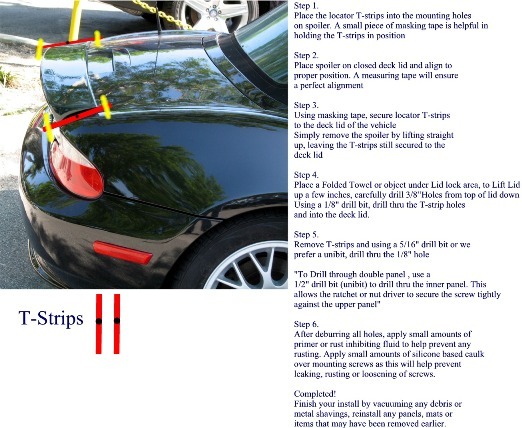 BMW Z3 Rear Wings, Spoilers, Aero Kits, and Safety Items. If you don't see what you are searching for give us a call. The BMW OEM spoilers are long gone but this OEM Style Rear Wing Spoiler fits 1996-1999 Z3 Roadster and ALL ///M roadsters. Same look and premium quality. 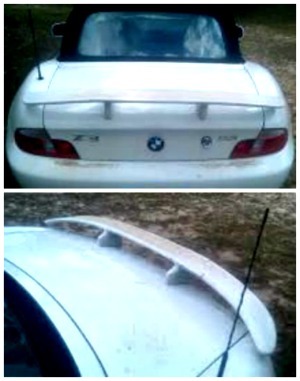 This spoiler is sold unpainted or painted to match your Z3 (add $100.00) and comes ready to install. Select the paint color and the model year of your Z3 on the checkout screen. Instructions and installation kit are included. Drilling is required for a very secure fit. Call us if you have any questions. The Hamann Style Rear Wing Spoiler fits the 2000-2002 models of Z3 and ///M roadsters. 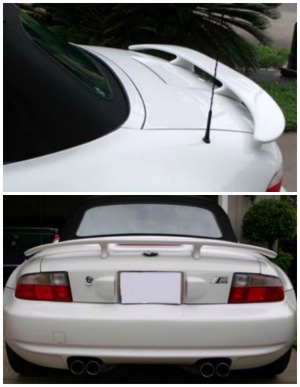 This spoiler is sold unpainted or painted to match your Z3 (add $120.00) and comes ready to install. Select the paint color and the model year of your Z3 on the checkout screen. The Hamann Style Rear Wing Spoiler fits the 1996-1999 models of Z3 Roadsters. 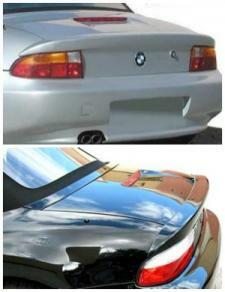 This spoiler is sold unpainted or painted to match your Z3 (add $120.00) and comes ready to install. Select the paint color and the model year of your Z3 on the checkout screen. The BMW OEM spoilers are long gone but this OEM Style Rear Lip Spoiler fits the 2000-2002 Z3. Same look and premium quality. This flush-mount spoiler is sold unpainted or painted to match your Z3 (add $100.00) and comes ready to install. Select the paint color and the model year of your Z3 on the checkout screen. Instructions and installation kit are included. The spoiler installs with 3M tape which is already applied to the spoiler and screws for a very secure fit. Call us if you have any questions. The BMW OEM spoilers are long gone but this OEM Style Rear Lip Spoiler fits the 1996-1999 Z3, but not the ///M roadsters (1998-2002). Same look and premium quality. This flush-mount spoiler is sold unpainted or painted to match your Z3 (add $100.00) and comes ready to install. Select the paint color and the model year of your Z3 on the checkout screen. Instructions and installation kit are included. The spoiler installs with 3M tape which is already applied to the spoiler for a very secure fit. Just clean the lid, peel and stick. Call us if you have any questions. 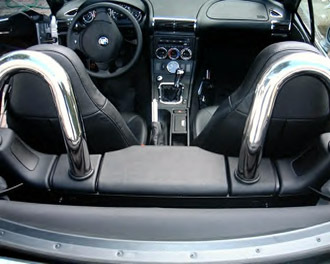 The Lower Front Aero Kit fits the 1996-1998 Z3 Roadster but not the ///M roadster/coupe. 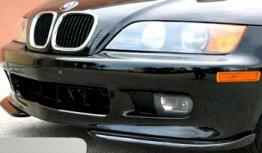 This ACS Style 2-piece front bumper lip spoiler is sold unpainted or painted to match your Z3 (add $100.00) and comes ready to install. Select the paint color and the model year of your Z3 on the checkout screen. Instructions and installation kit are included. Call us if you have any questions. CLICK on the PICTURE or TITLE to find your paint code. 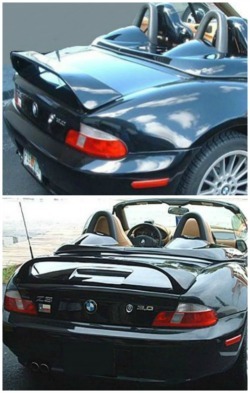 The Lower Rear Aero Kit fits the 1996-1998 Z3 Roadster but not the ///M roadster/coupe. This ACS Style 2-piece rear bumper skirt is sold unpainted or painted to match your Z3 (add $100.00) and comes ready to install. Select the paint color and the model year of your Z3 on the checkout screen. 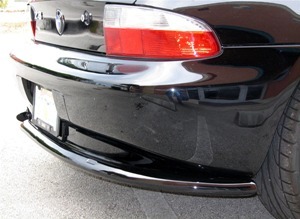 The Side Skirt Aero Kit fits all year models of the Z3 Roadster. 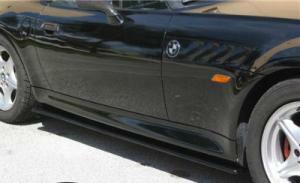 These Euro Style side skirts are sold unpainted or painted to match your Z3 (add $100.00) and come ready to install. Select the paint color and the model year of your Z3 on the checkout screen. 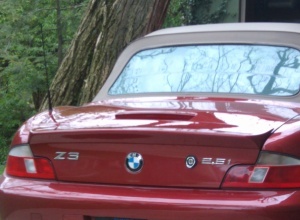 The Z3 Humps Speedster Cover gives your Z3 or M Roadster a unique sporty look. 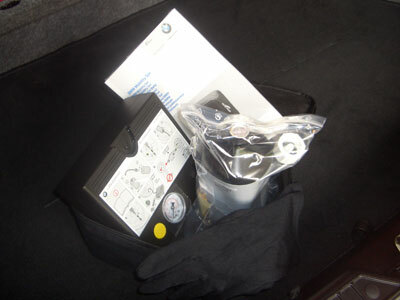 This cover comes unpainted or painted to match your Z3 (add $200.00) and comes ready to install. 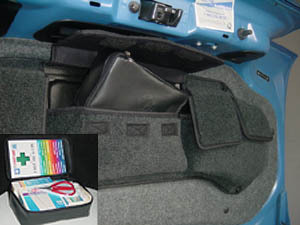 Completely assembled and hinged in the center, the humps attach to the four factory Tenax fasteners on the car and will fit in the trunk when folded (includes a storage bag). Select the paint color and the model year of your Z3 on the checkout screen. 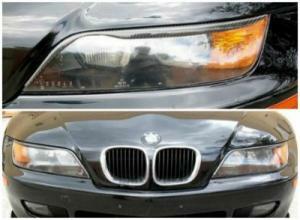 The Z3 Headlight Eyebrow Set gives your Z3 or M Roadster a unique sporty look. This light weight and strong set is made of Grade A Carbon Fiber and comes ready to install with urethane adhesive. Just clean the surface, apply the adhesive, tape the eyebrows down and let it dry! Installation instructions and adhesive are included. Call us if you have any questions. Enhance the beauty of your Z-3 or ///M roadster with the stunning appearance of hand polished Stainless Steel roll hoops. Brushed Stainless available by special order. No drilling or welding is required. 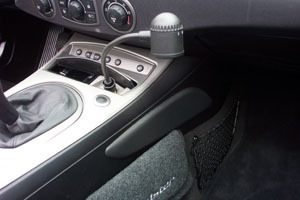 Easy to install yourself, or by local garage using factory mounting points. For model years 1998 through 2002. Diameter: 60mm or 2.4 inches. Wall tickness: 2mm or .08 inches.